Jane and Graham by Louise Donovan. I became friends with Jane through working with her in the Learning Shop in Norwich when I was the Open University Advisor. When it was quiet we had many interesting conversations. She and Graham became friends. I met Douglas when he was a few days old and have loved watching him grow into the fine young man he is becoming. 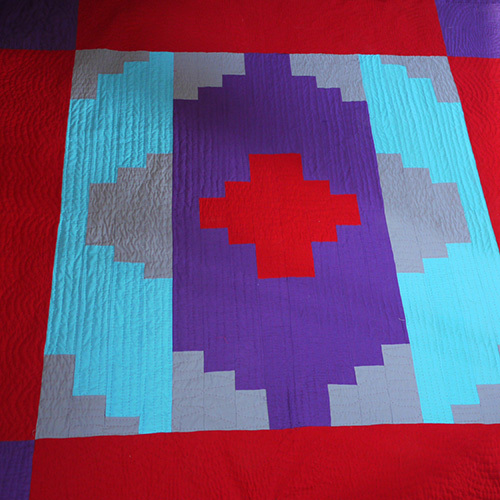 When Jane and Graham married I wanted to create a wedding quilt for them. I thought about the design for some time. I started with the colour red, as this was the colour of her beautiful wedding dress. I also choose purple as this is a colour we both like and could often be found wearing it on the same day at work. 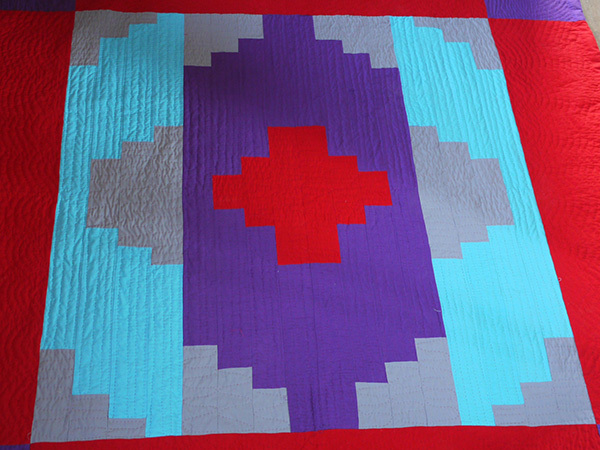 I then choose the colours of silver and turquoise to symbolize a message I wanted this quilt to give. Graham comes from a large family and is one of many siblings. Jane has one sister and was aware of the difference in size of family. When she and Graham returned form one of their holidays out to the States she gave me a book of Navajo Indian weaving patterns, which I treasure. This inspired the design, pattern and the silver and turquoise. Navajo jewelry is silver and turquoise. When I read about the Navajo I learnt that their understanding of family is wider than ours. It includes their clan, their friends. Jane has many friends from all the points of her life. 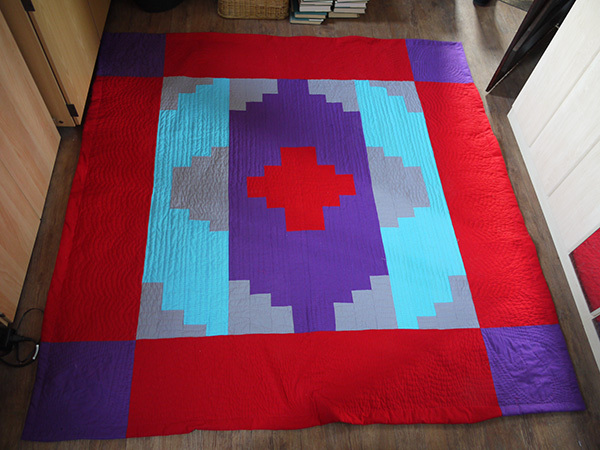 She has a great gift of friendship and I wanted this quilt to reflect this.